This compost bin is rodent-proof and easy to use. It will handle all your biodegradable waste items and last a lifetime with care! Featuring a 80-gallon (10.72 cubic feet) capacity, this ingenious tumbler design easily turns on its axis for balanced rotation, and the internal aeration bar mixes compost and provides air flow. Constructed of high-density polyethylene (HDPE), the compost tumbler is durable, UV-protected, and has dark, double-wall panels to absorb and retain heat. For added convenience, it has an extra large removable lid and a spring-loaded pin that locks rotation during filling. 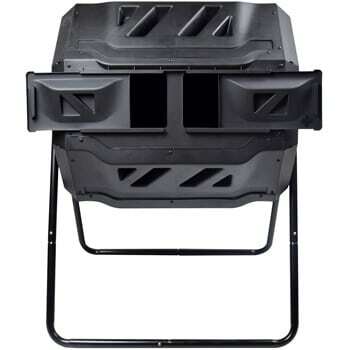 The composter is black with a galvanized steel base, and comes in 1 box, with a how to compost DVD included. Easy assembly with all hardware included.